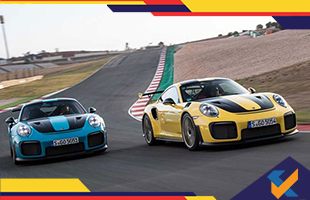 The luxury car Porsche is all set to launch its fastest ever 911 model, the GT2 RS, by June this year in India. The launch bypasses the launch of the electric Hybrid Cayenne. The GT2 RS will be equipped with a 3.8 litre twin-turbocharged flat-six engine that generates 686 bhp of power and 750 Nm of peak torque. It will be mated with Porsche's PDK dual-clutch 7-Speed transmission which can be switched between manual and auto mode. The gearbox also comes with extra GT- specific modes for quicker upshifts and aggressive downshifts. When it comes to acceleration get ready to be blown away by its capacity to accelerate from 0 to 100 kmph in just a matter of 2.8 seconds. The car promises a top speed of 340 kmph and a fuel economy of 8.5 kmpl. Currently the car is priced at around $300,000 in US. Hence one can assume that the price tag in India will read no less than ₹ 4 Crore.